If you were planning a round-the world (RTW) trip, how would you choose your destinations? For me, this is the most exciting part of planning for our upcoming one-year RTW travel adventure. But it can be a bit overwhelming – after all, you’ve got the whole world from which to choose. Bucket List: It’s easiest, of course, to start with one’s bucket list, regardless of how difficult or expensive the places may be to reach. Currently at the top of my list are Madagascar, Tanzania, Peru, Vietnam, Sri Lanka, and Fiji – not exactly neighboring countries, but all doable on a round-the-world itinerary. –>To connect the dots on your bucket list, you might try the easy-to-use flight tool at indie.bootsnall.com, which shows your path around the globe as you input your destinations, and then finds flights. Worldwide vs regional focus: Is your goal to get a broad overview of the cultures and geographies of the world, or to explore a particular region in some depth? In our case, we plan to continent-hop from South America to Asia, Africa, and Australia to get a taste of those places so that we know where we might want to spend more time in the future. –>To help gather ideas for our route, I’ve been using Google’s fun Explore Destinations tool, which shows a handy map of flight options and fares from any city you input. Budget: If you have a limited budget, you could choose the places that allow you to live like royalty on what you’d normally spend in any given day back home. In Asia, these include places such as Laos, Cambodia, Thailand, Vietnam, Nepal, and India; in South America, Bolivia, Ecuador, and Peru; and in Africa, Morocco and Egypt. Conversely, if you have a large budget, you could gather ideas in Afar, Global Living, or Elite Travel Magazine for the globe’s most luxurious destinations. Interests: You could build an itinerary around your interests, such as food, nature, architecture, eco-tourism, beaches, and the like. In our case, seeing the places Elise’s late father spent his childhood as the son of a UN geologist is a key interest area. Another is animals, since Elise loves them so much she wants to be a veterinarian. 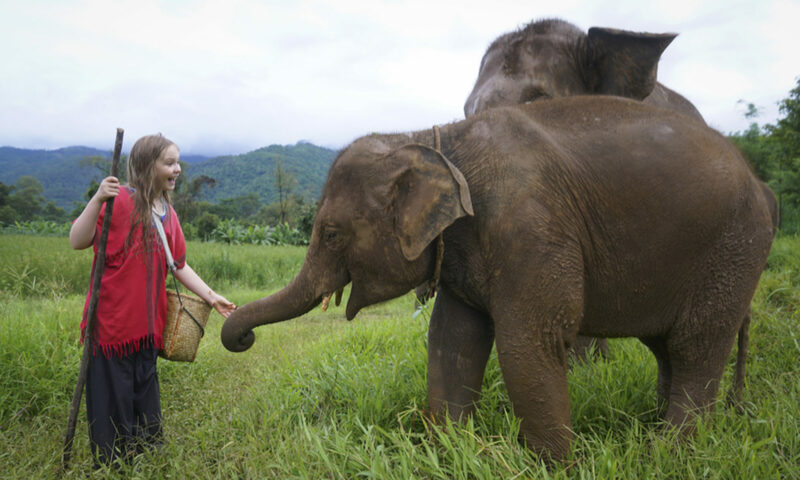 So, I’m looking at Thailand’s elephant rescue center and countries with unusual animal life such as the Galapagos Islands, Komodo Island, and Australia. Also high on my list are places of insane natural beauty or charm and epic beaches and treks. Best of Lists: Once you’ve identified your interests, you might try searching Best of lists to refine your choices, eg “Best Beaches in the World” or “Top 10 Hikes in the World”. I tend to look at the rankings from Lonely Planet, Trip Adviser, Rough Guides, National Geographic, and Conde Nast. When a destination appears on multiple lists – as do Matira Beach, Bora Bora and the Milford Track, New Zealand, for example – I earmark those places for closer review. Seven Wonders: For the ultimate natural wonders, underwater wonders, ancient and modern monuments, and even cities and feats of engineering, you might take a look at the various Seven Wonders of the World lists. I’m considering places on the Natural Wonders list, such as Ha Long Bay, Komodo Island, Iguazu Falls and the Amazon Rainforest, as well as Monument Wonders, including Machu Picchu, Taj Mahal, and the Great Pyramids. Holding Bin: You might also keep a separate list of places you’d love to visit, but which require monitoring due to safety concerns, logistics, weather, or expense. For us, as much as we would love to see Petra, Jordan is on this list, given ongoing unrest in the region, as is Fiji, because our window to visit may coincide with cyclone season. As I went through this list, eight countries emerged as clear winners! Peru, Ecuador, Argentina, Madagascar, Tanzania, Thailand, Vietnam and New Zealand all ranked high on nature, animals, and insane natural beauty. Ecuador and Argentina are also two of the places where Elise’s dad spent his childhood, Peru has Machu Picchu, and NZ the Milford Track. Japan, Myanmar, India, Sri Lanka, Indonesia and Australia also meet many of our criteria. Now I just have to figure out when the weather is best (i.e. mid-high 70’s, no monsoons) in each of those places, as we want to follow the summer. More on this topic in a later post! The study also ranked the top destinations for 2017 based on growth in the previous year: #1 was Jose Marti International Airport in Havana, Cuba (53%); Da Nang, Vietnam was a close second, followed by: Zhuhai, China (41%); Cusco, Peru (39%); and Santiago, Chile (38%). Cities in Uruguay, Iceland, Panama, Russia, and Mexico City were other mentions.